Who are the Mystery Knitters? Lets’s see, I’m just not sure—maybe we will have to be on the lookout for some cute little tykes running around in these garments when it gets cooler? These are about as cute as you can get, that’s for sure! ? Beth has been working out a knitted cap–sorry, the photo turned out too fuzzy. I have not yet mastered the close-up. Here is Deb with her Tenessee Charlotte–that’s loyalty to the max!. 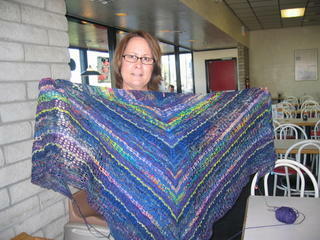 And with her is Carmen, who is a new addition to the Knit Wits and is working on a scarf out of chenille. She is doing a great job, don’t you think? It was pointed out that I dodge the camera by being behind it all the time, so here is a photo of Charlotte version 05.3. Yes, that’s my 3rd Charlotte. Who knows, I may do more. Or I may start a Charlotte-support group. You know, as weird as it might sound, I kind of miss not having a Charlotte around. It has such a nice rhythm to it. I am still in Providence, and this is something I picked up and started here. By the way–my red Spirit of the Southwest shawl is done and I have worn it on this trip. I will post a photo of it next week. This will probably be finished so that I can wear it to the Yuma/Cibola game on Friday. And I will bring it on Sunday too. It is made with one skein of a really tlhin yarn–this is Kid Seta mohair, and a think and thin, this is Colinette Pointe 5. with a size 17 needle. 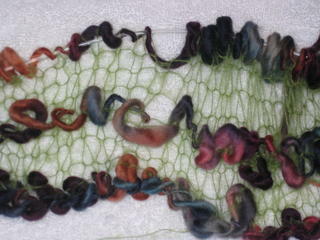 It is a free pattern from Knitty.com—roll your cursor over the headline, it will take you to the Knitty page. Knitty is a free online knitting magazine. Check it out–You will like it!